LONDON (Reuters) - Libya is losing some $130 million a day due to protests that have crippled the North African's oil sector, Prime Minister Ali Zeidan said on Tuesday and insisted he still wanted to solve the crisis through dialogue rather than force. 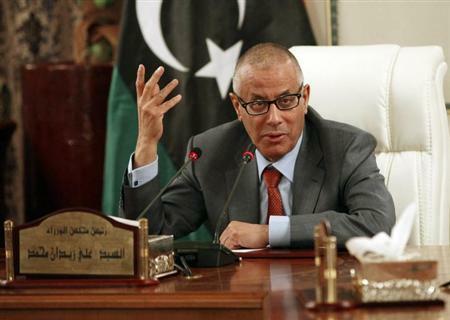 "We are going to work on solving this problem," Zeidan told an investment conference in London. "When blood is shed, the loss will be greater". The crisis has caused oil output to slump to around 250,000 barrels per day (bpd) from pre-war output of 1.6 million bpd. Zeidan confirmed output was resuming at the El Sharara and El Feel oilfields in southwestern Libya and that the Marsa al-Brega port had started to export again.